Find out everything you need to know on the new Lexus Nx from independent vehicle review website Car And Driving. You can watch the video review to the left to see more of the car or read their written review below to get a true insight from an expert in the automotive industry. 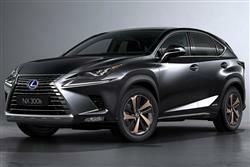 The Lexus NX SUV targets BMW's X3 and Audi's Q5 and has become one of the company's biggest sellers. Jonathan Crouch reports on the latest range. Here, Lexus throws the kitchen sink at the mid-size luxury SUV sector, its improved NX zeroing in more closely on the Audi Q5 and BMW X3. The range hinges primarily around the 2.5-litre NX 300t hybrid and is offered in either front or all-wheel drive. The sharper looks and beautiful interior are sure to secure no shortage of orders and the improved safety system is a welcome addition. If there was one word that could best be used to describe Lexus, it's probably 'audacious'. This is a car manufacturer that doesn't recognise boundaries as many do. Its very first car was a tilt at the Mercedes-Benz S-Class, widely renowned at the time as the best car in the world. It built the world's first luxury hybrid and even built a supercar that even today feels more special and exotic than an equivalent Lamborghini or Ferrari. For all its chutzpah and ambition, Lexus' footprint has tended to be narrow. Yes, the company has a luxury remit, but it's still been absent from many potentially lucrative market sectors where it ought to have been upsetting applecarts. In short, the brand could do with more models like this NX, a premium mid-sized SUV that targets models like the BMW X3 and the Audi Q5. On recent times, the range has been updated with smarter looks, an even nicer interior and stronger standards of safety. Lexus NX buyers get to choose between two powerplants. The more typically 'Lexus' of the pair is the NX300h, powered by a proven Lexus 2.5-litre petrol engine, generator, motor and battery with a total system output of 195bhp. Offered in front and all-wheel drive versions, the NX 300h is equipped with one or two electric motors respectively. It also gets sprung-weight damping control to increase ride comfort and handling stability by reducing pitching when driving on uneven surfaces. Alternatively you could get the NX 300, powered by a 2.0-litre petrol turbo engine. Both all-wheel and front-wheel drive versions will be offered in some markets, but here it's being pitched as the sporty option and sold exclusively in all-wheel drive F Sport guise. Maximum power is rated at 238bhp between 4,800 and 5,600rpm and maximum torque is 350Nm, available from 1,650 to 4,000rpm. It's mated to a six-speed automatic transmission that has been specially tuned for the NX. A lot of attention has gone into improving body rigidity, with extensive reinforcement of the underbody, additional bulkheads and weld points, and extra suspension braces. An Adaptive Variable Suspension system is offered, which talks to the car's Drive Mode Select system, to alter the level of damping force to improve ride comfort and improve body control. Remember when Lexus tried to look like their competitors? Seems a bit quaint now doesn't it? These days there's no mistaking a Lexus for anything else and this NX remains distinctive and stylish, especially in this revised form. The signature spindle grille has a smarter look that aligns it more closely with the brand's RX luxury SUV and the upper part of the front bumper has been re-shaped so that it blends more fluidly into the bonnet. The headlamps have been revised too to accommodate a new Adaptive High-beam system, plus there are now sequential turn indicators, front and rear. There's a more stylised bumper at the back too, and re-styled tail lamp clusters with L-shaped lenses. Inside, the key change is an increase in size for the central multi-media display. In the case of the Lexus Premium Navigation system, the screen has grown from seven to 10.3 inches, while for the Lexus Display Audio set-up, the increase is from seven to eight inches. Other changes include a larger central analogue clock, a revised climate control panel and an improved touchpad for the infotainment monitor. As before, the interior also owes little to the premium German brands in its design ethos. Lexus aimed to combine the purpose of a high-performance vehicle with the materials quality of a luxury vehicle. The centrepiece of the dash is a curvaceous H-shaped metal frame that's a world away from a typically slab-fronted SUV fascia panel. Details like drilled pedals and quilted leather seats differentiate the cabin from the usual suburban SUV norm. Practicality certainly hasn't been overlooked though and the NX offers decent headroom, a generous front-to-rear hip point distance and the longest luggage area load length in its class. At the foot of the NX range, prices start at around £31,000 for a 2WD NX 300h in S trim, with the figures then rising all the way up to top Premier trim setting you back around £45,000. Lexus offers no fewer than six trim level options, although not every grade is available with every chassis/engine configuration. There's the all-wheel drive 'F Sport'-only NX 300 petrol model. And then, for the NX 300h hybrid variant that almost everyone buys, there are all-wheel drive SE, Sport, Luxury, F Sport and Premier grades, plus an entry-level front-wheel drive S grade. This being Lexus, even the humblest trim comes with the sort of gear you'd have to tick a depressing amount of options boxes for in many rivals. You'll get LED low-beam headlights and daytime running lights, a Pre-Crash Safety system and Adaptive Cruise Control, dual zone climate control, a Lexus Media Display with Remote Touch controller, a DAB digital radio driving eight speakers, a USB port, electric folding door mirrors and 17-inch alloy wheels. Then there's safety gear like Vehicle Dynamics Integrated Management, Hill Assist Control and eight airbags. The most recent addition to the line-up is the Lexus Safety System +. This equips the car with a range of active safety and driver assistance features, include a Pre-Collision System, Adaptive Cruise Control, Adaptive High-beam System, Lane Departure Alert and Road Sign Assist. Intelligent Parking Sensors are also available. Around town, the NX 300h hybrid variant brings the full benefits of its petrol/electric powertrain to bear. At first glance, the one mile limit for progression under all-electric propulsion seems a bit feeble but in practice, you use that allocation only in very small chunks between which the battery resource is constantly being replenished by brake energy regeneration. As a result, in built-up areas and stop-start traffic, the engine's nearly always ready to function in silent all-electric milk float-mode. Which explains why this petrol model can deliver running cost figures that better those of rival diesels, specifically 55.4mpg on the combined cycle and 121g/km of CO2 in the 4WD version. Go for the 2WD 'NX 300h S' variant and the returns improve a little but not hugely: the 4x4 model does, after all, function nearly all the time in front-driven form as well. The 'S' model manages 56.5mpg on the combined cycle and 116g/km of CO2. That only leaves the returns you'll get from the single conventionally-engined model in the NX range, the NX 300 petrol turbo. This of course can't get near to hybrid standards of efficiency, but it does manage a combined cycle showing of 35.8mpg, plus 183g/km, which is very similar to the kind of return you'd get from a rival Range Rover Evoque Si4 or entry-level petrol-powered Porsche Macan. Lexus needs the NX - and needs it to do well. For that to happen, this car will have to offer more than the traditional attributes that spring to mind when you think of this brand, things like reliability, quality, refinement, technology and great dealer back up. Of course, the company's proud of the reputation it's built upon these virtues, but it's well aware that for this model to succeed against well-established rivals like those from Range Rover, BMW and Audi, worthiness isn't enough. Lexus needs desirability. It needs design flair. It needs excitement. It needs... an X-factor. Spend time with this NX and increasingly, you find yourself agreeing that this is just what's on offer here. The NX may be a little too individual to sell in the kind of numbers its maker would really like - but then that's all part of its appeal. It's not perfect but it's never boring. And in a market sector that's getting just that little bit stale, it's a breath of fresh air.